One of the biggest reasons why people lose motivation in working out is boredom and, honestly, working out isn’t always a pure joy. But there are many alternative ways to work out and a fun one to try are aerial exercises. They are easy to get into and will make you sore like never before! Discover Your Inner Aerial Artist! The best thing that ever happened to me in my active life style was when I discovered the funnest way to stay in shape – aerial classes. These methods are becoming more and more popular as one of the best and a much more exiting way to exercise. 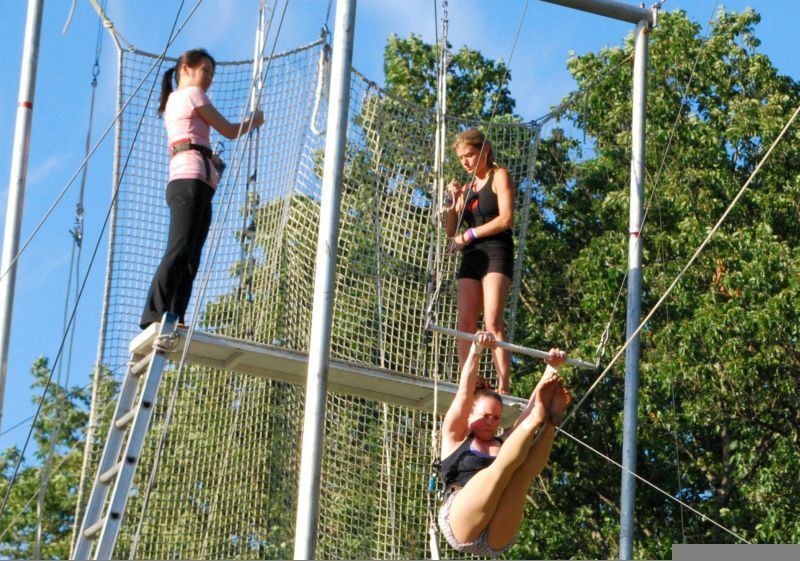 I am talking about aerial trainings such as rope climbing, aerial tissue and flying trapeze. Even if you are a complete beginner (which is what I was when I first tried it ), you will still be able to learn quite fast. Our bodies adopt at a much faster pace than we think. These types of workouts are not just for acrobats anymore, right now aerial tissue and trapeze classes are becoming available to regular public, and everyone is loving the results. When I first discovered this type of training, one of the things that I loved about it was how fast the time went by, and how great I felt after. You didn’t have to talk me into working out, I couldn’t wait to go – seriously, have you ever felt like that? And the results were incredible. I’ve never had results like that at the gym doing regular workouts, never. Every muscle in your body will work like it hasn’t before and you will feel and see results after the first time. You will develop strength, balance, flexibility, you will gain muscle mass, lose fat and you will learn how to manipulate your body in the air. When I first started, I couldn’t even do the simplest of things such as holding on to the rope, but within a few weeks I was climbing like nothing and a few more months later I was doing things I didn’t ever imagine I could do. Depending on which type of training you will choose, there are always different levels available, such as beginner, intermediate and advanced. If you are a beginner, you will just learn the basic swing inside of a safety belt, a little bit of body manipulation and landing onto the safety net. In the first days it is more about momentum rather than strength, but once you understand the technique, it will be quite easy to gain strength. Definitely expect to be extremely sore all over your body, especially in your abs. If you choose aerial tissue, which of course also has different levels, the first thing you should expect to learn is climbing, probably on a regular rope. There actually is a technique used in climbing that does not require much strength, so anyone will be able to learn it fast. You will also learn how to do the basics, such as a split in the air (don’t’ worry, you don’t need a perfect split to learn how to do it ) or wrapping the tissue around your body. Maybe even some aerial drops – it all depends on your progress. You can find classes in specialized gymnastic gyms in almost any city. They are just like any other gym and usually have gymnastic equipment as well as regular exercise equipment. They often offer membership services or you can pay separately for just the classes. This is a truly unique and fun way to stay in shape. I’ve met so many people who tried aerial classes and fell in love with it so much that they made careers out of it. Once you try it, regular exercise will never look the same! Pictures courtesy of Nan Palmero and Laura Bittner.